Since 1949, when it was established in Turin by Eugenio Audisio, Dual Sanitaly has been committed to a single objective: operating responsibly in the health and wellness sector. Today, as it reaches its third generation, the family company relies on market leading products. 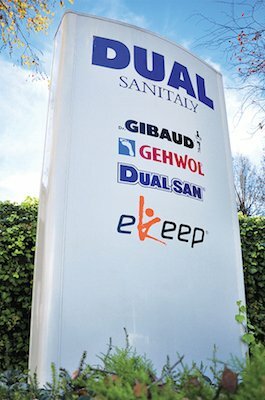 Dual Sanitaly has approximately 90 employees working in the company’s headquarters in Moncalieri (Turin) in an 11,000 m² plant, of which 6,500 are covered. Dual Sanitaly customers include the best Italian chemist’s shops, health and beauty stores, sanitary and orthopaedics outlets, which are diligently followed by our sales network operating on the national territory. The information is provided by a specific network of pharmaceutical representatives who are in daily contact with medical specialists in Orthopaedics, Physiatry, Rheumatology and Sports medicine, to promote and improve the use of Dr. Gibaud® Ortho orthopaedic equipment. The company is currently established as a joint stock company with a fully paid-up capital of € 1,040,000.00.